The distinct architecture of the Park Cities is one of its most charming features. Tudors, colonials, ranches, contemporary and Spanish tile beauties march up and down the tree-lined streets. Many of the homes echo the times in which they were built- for better or for worse. There was no such thing as an open floor plan in the early part of the 20thcentury and vinyl flooring became popular in the 1940s. Now, many homeowners want to retain the original beauty and quirks of their historic homes while giving them necessary modern conveniences. Greg and Denise Brown were enamored of their 1920s Tudor-style home but needed to modernize their kitchen so it better fit their family. A tiny kitchen, cut off from the rest of the house, left little room to cook or entertain. Working with William S. Briggs and Blackline Renovations they were able to create a kitchen that felt open and airy, while still maintaining its functionality. Despite the home’s classic Tudor charm, the kitchen is pure modern luxury. “When it comes to kitchens, the design and style elements can stand apart from the rest of the home without seeming incongruous. 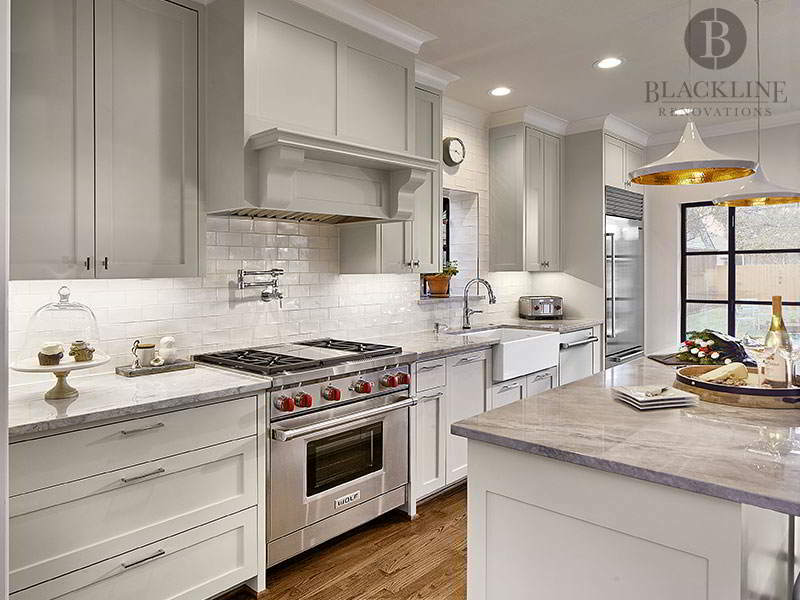 In the Brown’s new kitchen, the white subway tile and gray marble countertops are going to provide a neutral, functional space that will serve them well for years,” said Chris Black, President of Blackline Renovations. Outfitted with a full Wolf appliance package, the kitchen also featured an over-stove faucet and a custom vent hood that blends in perfectly with the custom cabinetry. 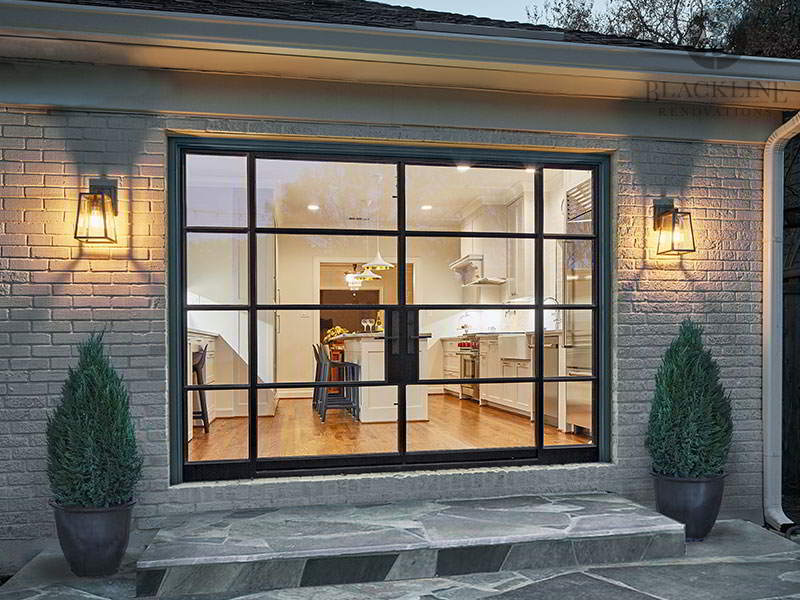 The large steel Portella window system was a particularly important element to the homeowners who wanted to bring the light in from the backyard. Another garden window above the farmhouse kitchen sink provided yet more light and a unique design feature. The full kitchen remodel, which took 4 months to complete, was actually just the first phase of a larger home renovation project. Now, in phase two, Blackline Renovations is back at the Brown’s home working on building a garage that will sit next to their new pool.